The range of single compression type brass cable glands which we offer can be used under every climate condition. these are waterproof in nature and can be used in the corrosive conditions when protected by the shroud. These are also enabled with extra component and can be customized according to the users approach. 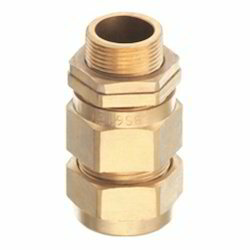 This range of single compression type brass cable gland is used for runaround cable helps in providing electrical continuity between unarm our cable and gland entry component. These also provide seal on the outer sheath of the cable, thus ensuring no damage to cable sheathing. These are used in indoor and outdoor applications and can sustain all climatic condition and water. Looking for Single Compression Type Brass Cable Gland ?